Homeowners on a budget choose laminate flooring for any room in their homes, confident that they will get an affordable price without sacrificing quality and durability. 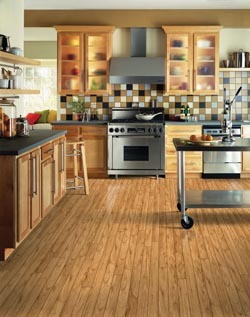 Modern manufacturing techniques have made laminate tile or laminate wood flooring the go-to options for any home, ensuring single-room or whole-house installation goes smoothly and lasts long. Our full stock of laminate tile flooring and laminate wood flooring give you the style options you want at the prices you need. Come in today and let our flooring experts support your choices from start to finish. With guaranteed industry-leading prices and expert flooring installation, our reputable flooring store is the all-in-one option for area homeowners. We have grown our business year-over-year with a laser-like focus on customer service, and our locally owned and operated small business is dedicated to personalized support for every flooring shopper. However, this excellent level of service does not come at the cost of higher flooring prices. With the almost unique ability to be installed at any grade, laminate flooring is the perfect solution for any room in the home. Scratch and stain resistance make it perfect for growing households, and the moisture resistance of laminate tile or laminate wood flooring ensures a low-maintenance floor for kitchens and bathrooms. Maintaining the like-new condition of your flooring is a simple matter of daily sweeping, supplemented by regular mopping and the occasional floor polishing for special occasions. Once you have found the perfect laminate flooring option, call in our expert installation team for final installation. After a full room measurement to give you the opportunity to buy only as much flooring as you need, our crew swings into action to get your flooring installed fast and accurately. The trusted speed of our laminate flooring installation is made possible by the special manufacturing design, usually incorporating some sort of “click-lock” tongue-and-groove system for accurate installation. This, combined with our absolute flooring installation guarantee of workmanship, gives homeowners the confidence they deserve in their new laminate floors. Call to find out more about our ongoing specials, or come in today to talk to a flooring expert about laminate options and installation. We proudly serve the communities of Seaside, Astoria, Cannon Beach, Manzanita, and Gearhart, Orgeon, as well as on the Long Beach peninsula.